Sales and rentals fund our philanthropic projects and programs! Original Traditional Sculptural Art, consisting of mixed media sculptures by Victoria Lee Croasdell, an awarded, published and exhibited; multi-disciplined artist, photographer, writer, poet and engineer. She is also a member of MRISAR's R&D Team. She is the primary designer of all MRISAR graphic headers, exhibit display borders (like the one above), exhibition graphic panels and design details on our robotic and science exhibits. The slide show above only contains a portion of the art created by three generations of artists. Contact us if you are interested in renting or purchasing any of our original art pieces! Sales and rentals help to fund our philanthropic work! 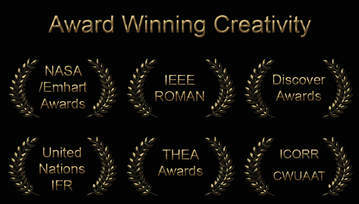 ​Award Winning Art exhibits created by MRISAR's R&D Team, a family of Artists- Engineers!